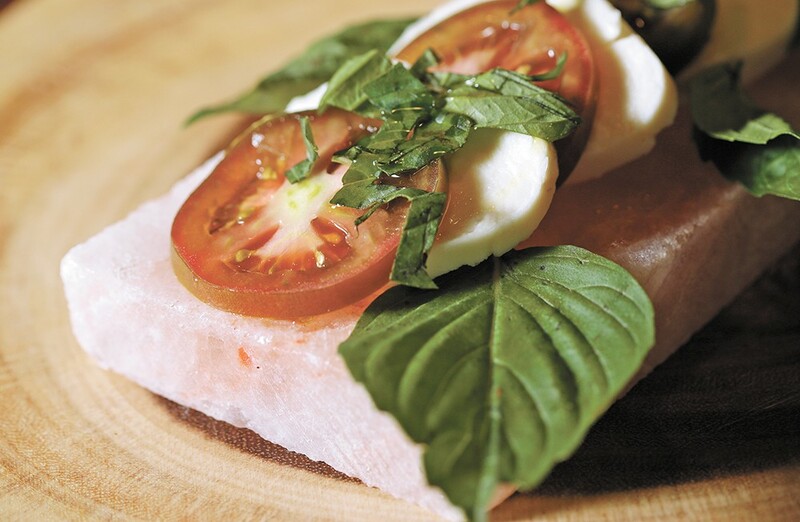 Himalayan salt blocks can be used both for hot cooking and cold serving. Salt is an essential element for all animal life, including humans, who long ago realized the naturally occuring substance was an effective preservative and flavor enhancer. In addition to the ubiquitous table salt, variants include kosher salt, sea salt, Celtic salt, fleur de sel, and so-called Himalayan salt. The latter of this list is the only type, however, that has evolved as a tool and technique in food preparation, especially cooking. What it is: Himalayan salt hails from an ancient mine in the Punjab region of northern Pakistan, which, according to local lore, was discovered by Alexander the Great in 327 BC. Evidence supports the mine's operation in the 13th century, but it wasn't until the 18th century that the conquering Brits struck gold, so to speak, bringing modern methods of excavation and collection to the site. In the 20th century, marketing did its part to elevate Himalayan salt, first in the 1980s, when chunks of the dense, pinkish material that resembles alabaster marble were hollowed out to create supposedly health-yielding salt lamps. That, says semelier, or salt expert, Mark Bitterman, may have led to the idea of cooking directly on a salt slab. Bitterman, the James Beard Foundation award-winning author of Salted, championed salt block cooking with his 2013 tome offering techniques for searing, serving, grilling and more. It was a hit. Why salt blocks? 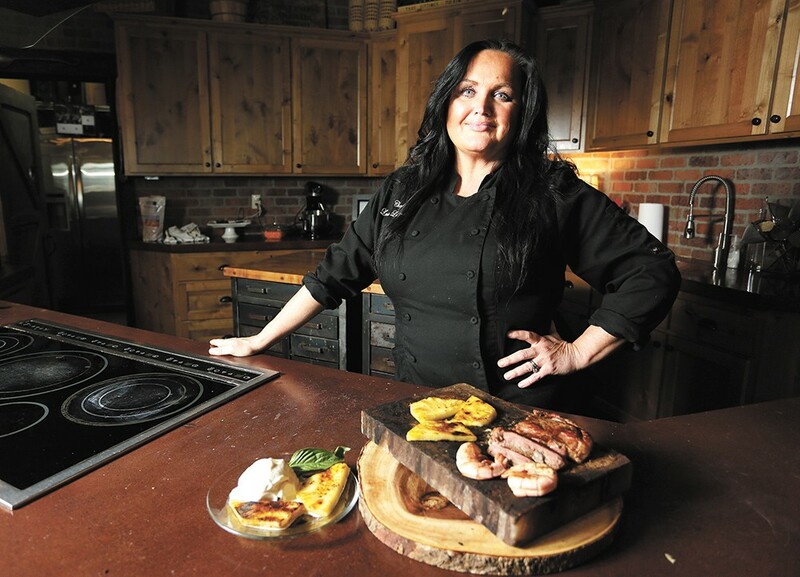 In addition to being visually appealing, local chef Lesa Lebeau found that salt blocks can be a good tool to reduce added sodium, especially when cooking for her husband who has health issues. And she really likes the taste. "It almost has a umami flavor," the chef says. Lebeau graduated from the Academy of Culinary Education in Los Angeles, eventually working with famed chef Wolfgang Puck and cooking for a plethora of celebrities before relocating to Coeur d'Alene four years ago. She now teaches cooking classes at the Culinary Stone, including one on salt block cooking. Trace minerals in the salt — potassium, magnesium, calcium — are responsible for the block's flavor, while iron oxide gives Himalayan salt its unique pinkish color. Those same trace minerals are alleged to be part of Himalayan salt's superior health benefits and even curative powers, few of which have been scientifically substantiated (the U.S. National Institutes of Health has studied sea salt, but not Himalayan salt). Meanwhile, other health experts pooh-pooh the notion that Himalayan salt is outright healthier, yet generally concede that it's less processed than typical table salt, which contains an artificial anti-caking agent to absorb moisture. Even though most salts, including Himalayan, only contain about 40 percent sodium overall, total daily intake of sodium, versus the salt itself, is still the number to watch, healthwise. The recommended daily allowance is between 1,500-2,300 milligrams, depending on the health organization, translating to no more than a teaspoon of salt of any kind or source daily. The average American consumes 3,400 milligrams per day, reports the American Health Association, with most of that coming from processed foods versus salt used when cooking. A McDonald's Big Mac, for example, has between 970-1,700 milligrams of sodium. The most salty foods? Pizza, yeast breads, cold cuts and cured meats and cheese. Yet with salt block cooking, says Lebeau, you don't need to add any seasoning, including salt. Chef Lisa Lebeau teaches classes on salt block cooking at the Culinary Stone. "If you do, use seasoning that is void of any sodium," says Lebeau, who is teaching her next salt block cooking class at the Culinary Stone on Feb. 9. "I started the class because people get these as gifts and don't know how to use them," she notes. How to use it: Salt blocks can be used hot or cold, says Lebeau. In her own kitchen, she often uses two slabs just for serving cold food, and two more for cooking in the oven or on the grill. When preparing a steak or tenderloin Lebeau puts her salt block into a cold oven, turns it up to 450 degrees and lets the slab get really hot. Once she removes the hot block from the oven and places it on a trivet or towel, she "cooks" the room-temperature steak on the scorching salt block. For a rare prep, the meat only needs two minutes of cooking per side, depending on thickness, and four to six minutes for medium to well. Because they're so dense, salt blocks not only hold their temperature a long time, but can withstand extreme temperatures of up to 700 degrees, says Lebeau. This allows for very fast cooking, which is ideal for searing meat and vegetables, as well as seafood like prawns, which Lebeau typically cooks shell-on to actually diffuse saltiness. With cold food, such as fruits or salads, Lebeau refrigerates her slabs for two to four hours (or freezes it between three and six hours) prior to serving food. In both hot and cold applications, Lebeau only leaves the food on the block a short period; the longer it remains on the block, the more the block sweats and the saltier the food tastes. Accumulated liquid can also erode the block's surface faster. Lebeau likes to pair saltiness with unexpected ingredients, including sweet fruit. Her pineapple-salted ice cream is a twist on salted caramel; the intense heat of the salt block caramelizes the pineapple slice and gives it a faint salty taste at the same time. The original print version of this article was headlined "Worth Its Salt"